After seeing all of the photos of the red and white quilt exhibit at the American Folk Art Museum in New York, I thought I would show you the red and white quilt that was made by my Grandmother. She died in 1923 so I know this quilt is at least 88 years old. As you can see in the photo, it has been used and well loved. Even though the quilt is not in perfect condition, I'm so happy that I have it. This quilt is made from the Jacob's Ladder pattern. I pulled some of my red fabrics and decided to make a block. I think I should have either used a white background or made the shirtings scrappy. This is how the same block(s) look made with random scraps. Right now I'm really liking the red and white block. Hope you are all stitching today. Thanks for stopping by for a visit! A week ago today, I had some of the finished blocks for this wall hanging up on my design wall. After switching the focus fabric to this piece of Paula Nadelstern Symmetry that I had in my stash, I really liked the direction the project was going. So I finished paper piecing the rest of the blocks this week and finished the top. I think everyone that weighed in on the outer border color thought the burgundy would look best, and I have to agree. The pattern can be found in the book Easy Stash Quilts by Carol Doak. Next week I'm going to a quilt retreat, but I plan to get busy and quilt this afterwards. Thanks to Judy L at Patchwork Times for hosting Design Wall Monday. I hope you are all finding some time to stitch today! Thanks for visiting! I'll email Rhonda to get her mailing address. Thanks to all of you who entered and were interested in the punch needle embroidery supplies. Thanks for stopping by and congratulations to Rhonda. I had a brief fling with punch needle embroidery awhile back and found it is not my cup of tea so I am having a giveaway. There are the 5 patterns below. The patterns finish somewhere around 3" X 5". Also included is the punch needle and threader (with directions), the no slip hoop, floss and a piece of cloth. Two of the patterns also have cloth included. I'll even send along the piece that I worked on that is almost finished. It is all quilt shop quality and came from Back Door Quilts or Quilts Plus, two of my favorite local quilt shops. I would like to find these things a good home with someone who would use them. If you are interested, leave a comment and let me know. Thanks for visiting. I hope you are all stitching today. This is what is on my design wall this Monday morning. This is my version of the cover quilt from Easy Stash Quilts by Carol Doak. I believe the book came out in 1999, and so I probably made this quilt about then. Now I'm trying to do this quilt in another colorway. I bought 2 yards of this focus fabric (below) last summer at a quilt show and began making the blocks based on that fabric. I stopped working on this last fall because I just didn't like how it looked but wasn't sure how I wanted to change it. Then I found this piece of Paula Nadelstern Symmetry fabric in my stash, and I like the blocks much better with this focus fabric than with the original. I had drawn an extra line in the paper piecing pattern above in the flying geese block before to try and add a touch of orange to help tie it all together. So I'm redoing those blocks to take out the orange so they look like the photo below. As I was redoing that block, I got the idea﻿ to fussy cut one of the circles from the Symmetry fabric and put it in each of those pieces. Then I fussy cut one of the large circles and applique'd it over the center piece. ......or this green. I'm not sure yet, but I'm leaning toward the burgundy. Thanks to Judy L. at Patchwork Times for hosting Design Wall Monday. 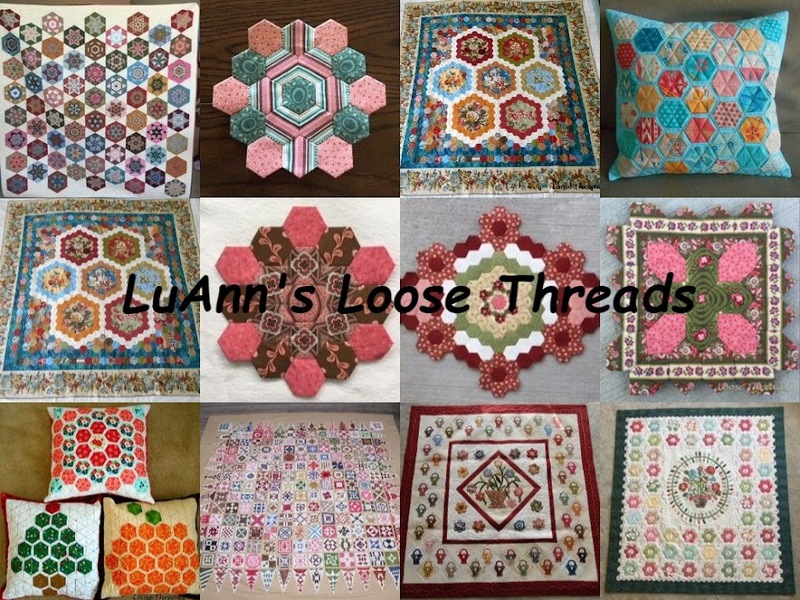 You can go to her blog to see a list of links to what other quilters are working on. I hope you are all finding some time to do a bit of stitching on this first full day of spring!!!! Thanks for stopping by for a visit. Well, ok...I'm not really blue...at least not that kind of blue. But, it seems most everything I took photos of for this blog post turned out to be blue. My daughter is here visiting for her spring break from Purdue, so I haven't spent a lot of time in the sewing room this week because we have been having a good time. But, I did sew a couple of hexagon flowers for One Flower Wednesday. I usually try to do two flowers because I almost never get my one flower posted on Wednesday. At least that's how I rationalize it. One Flower Wednesday is hosted by Karen over at Journey of a Quilter. Thanks Karen. The fabrics in these two hexagons are from an old...really old...line called Cocheco. I loved this fabric line and bought quite a lot of it. My brother-in-law came over on Monday night with this plate that he brought back awhile ago from one of our sisters-in-law that lives out in Colorado. She is always sending me the neatest quilt related things. I just love it! The last few weeks I have been on a Stromboli kick. I saw a recipe and some photos on another blog and gave it a try. Everyone here loved it, and it has become a weekend staple here the last several weekends. I just buy frozen bread dough and take out 2 loaves and let them raise. I roll them out and put pizza sauce, fried Italian sausage, pepperoni, parmesan cheese, oregano, basil, Italian seasoning, Parmesan cheese, shredded mozarella and then roll them up and bake. If anyone wants a tutorial, let me know because I'll be making it again tomorrow and can take photos. This photo is NOT stromboli. We just wondered what a loaf of that frozen bread would do if we let it raise in a bread pan and then baked it like it was intended. Here it is, and it tasted as good as it looks. ﻿Hope you are all finding some time to do a bit of stitching today. On my design wall this Monday is my center and part of border number 2 of the Hearts and Flowers Quilt. The pattern is by Kim McLean and can be found in Kaffe Fassett's Quilt Romance book. I just finished all of the hand applique' on the center section and have just started the second border. The borders aren't sewn on yet but just placed on my design wall to get an idea of what the finished quilt might look like. Here is a close up of the center section. The center of the large heart is a Phillip Jacobs fabric. There are several of his fabrics in this quilt as well as Kaffe Fassett's. I just love working with these fabrics. These leaves and hearts are actually border number 4. Since this border is made up of individual blocks, I started there. This quilt has been a UFO since sometime last fall. If you visit the Glorious Applique' blog, you will see how others are doing on their various Kim McLean patterns. We are all fans and think her work is amazing. Hope all of you are finding some time to stitch today. Thanks for visiting! This is my first Dresden Plate. I have had this template for several years. A few days ago I saw a post on Anne Marie's blog showing some beautiful fabrics and her Dresden Plate template. I left a comment on her blog telling her that I have had that template for ages and never did anything with it, and we exchanged a few emails about making these blocks. When she posted her first Dresden Plate block on her blog, she challenged me to make one, too. I used Modas Fresh Flowers by Deb Strain, and I hand applique'd the block to the background and then the center onto the block. The widest part of the fan is 12", and it is applique'd onto a 16" block. The blades in the fan are cut at 5 inches. I was ready to cut the blades from a charm pack when I realized that you can cut these blades from a 2 1/2" strip of fabric. Since I had strips leftover from another project, I used those. So this project was easy to cut. One jelly roll strip @ approximately 40" will yield 8 fan blades that are 5". 40 strips in an average jelly roll will yield 320 blades (8 per strip X 40 strips). And.....today is Scrappy Saturday over at Angela's So Scrappy Blog. This months challenge color is green. Since I was in the mood to make more Dresden Plates, I pulled out my green scraps and cut this one out and started sewing. But then I got an idea and decided to try something else and ended up with this. Hope you are all having a good weekend and finding some time to stitch! This past Saturday I attended the Indiana Heritage Quilt Show in Bloomington, Indiana. Bloomington is about an hours drive from here, and this is really a nice show every year. There are always several nationally known teachers that hold workshops/classes; and there are vendors and more vendors. More on that later. Most of the quilts from the show are on my webshots page. After you click on the album you want to view, there is a slideshow option over on the right. I may have missed one or two quilts, but I don't think I missed many. Enjoy. The colors in this one were just gorgeous. Quiltmaker Suzanne Marshall of Clayton, MO. Here is a closer shot. The flowers seemed to just pop off the background, and the hand quilting was wonderful! This photo doesn't do justice to the quilt. The applique' was just gorgeous. The quiltmaker is Claudia Lash of Speedway, Indiana. This is from a pattern by Barb Adams and Alma Allen called Peppermint and Holly. Quilt by Elvira Illig of Elgin, IL. This one is by Carolyn Tully (can't read the city and state). This one is striking in person. The colors in this one are gorgeous, and if you look at it the right way it creates an illusion of looking like an upside down bowl that is really pretty. This is by Ann Pigneri of Louisville, KY. This one was beautiful. I love the red and green together. Apologizes to the quiltmaker, but I didn't get the name on this one. This small cat quilt looked so realistic. This is the Best of Show quilt by Mary Buvia of Greenwood, IN. Her work is just gorgeous. There is so much attention to detail in all of her quilts. She was the featured artist at the show, and the first photos in my webshots album are of her quilts. Hope you enjoyed the show and are inspired by these gorgeous quilts. Happy stitching today. This is what is on my Design Wall this Monday morning. This project is called Old Saint Nick. The redwork Santa has been stitched for awhile - ok for several years. The inside checkerboard border has been attached, too. But for some reason I worked a little on the triangle border and then I would put it back into a baggie and just couldn't seem to get past it. After working on another project with similar borders and seeing how close I was to finishing this project, I was able to put the outside pieced border on this wall hanging and finish the top. I know it is still a UFO, but I think anything that you can do toward moving a project from one step of the process along toward completion and a finish is going in the right direction. Here is the magazine that contains the pattern: Quilt It for Christmas by Quilter's Newsletter. Taking it out of the bag and paging through it was just like going to the store and buying a new magazine. I'll just be honest about the magazine. It is from 2000, so it is far from a new magazine. Thanks for Judy L. for hosting Design Wall Monday. I hope all of you are finding some time to do some stitching today and that you are moving some of your UFOs toward a finish. Have a nice day! I am a day late for One Flower Wednesday hosted by Karen over at Journey of A Quilter so I'll call this Two Flower Thursday. I've made two hexagon flowers for this week. I am using the paper pieces that are 3/4" because I've bought so many of those. I am getting a nice little collection of flowers. Soon it will be time to think about a setting for them. 1. When you roll over a hot link like this: Roswitha's blog instead of clicking the link with your left button...click with your mouse wheel. (Not only does your mouse button roll, but you can also click it. I didn't know that for a long time. I used to think that the right mouse button was there as a stress reliever while you were waiting for a page to load!) Clicking with the mouse wheel will open up the new window in a tab that will show up in this window up at the top of the page. That way you will be sure not to lose the original blog you were reading. You can do this with multiple links like the ones I have on my sidebar and open up several tabs at once. When you are done looking at Roswitha's blog or whatever you have opened up in your tabs, you just go up to the tab and click the X on it, and it will disappear. This way you can open up several tabs and still keep track of where you started. Tomorrow is going to be a stitching day for me. Hope you all find some time for some stitching, too. Thanks for visiting!